Josh Stein, 22, is a double amputee rehabilitation patient at Brook Army Medical Centre. He lost his legs to an EFP explosion in Iraq on Easter Sunday 2006. The Department of Veterans Affairs is in the news over a serious scandal. 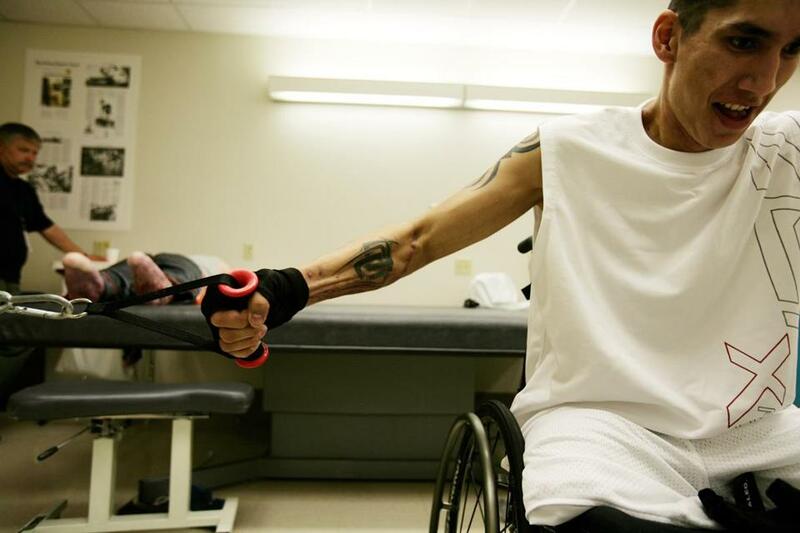 But the focus on VA hospitals obscures a separate but massive problem in the VA’s disability-benefits system, whose function should be to treat and rehabilitate veterans to enhance their ability to work. There are huge backlogs of disability claims, increasing numbers of medical conditions that count as disabilities, and, most important, a set of bureaucratic procedures at the Veterans Benefits Administration that cost hundreds of millions of dollars and create all the wrong incentives for recovery. There’s one common thread with the other VA scandal: In both cases, the agency’s genuine desire to serve veterans has exceeded its ability to deploy a system that works well in practice. Here is how the disability system works: A veteran who has a specific problem, such as hearing loss or post-traumatic stress disorder or a spinal injury, must show that it occurred during military service. This makes the veteran eligible for a “service-connected” disability rating, which rises with the severity of the condition. The rating ensures care at a VA medical center and a monthly cash payment — for life — ranging from $2,816 for a veteran rated at 100 percent (a total incapacity to work) down to $129 for a 10 percent disability . The current system — which was established in 1917, before modern treatments became available — was never intended to promote rehabilitation. Instead, it presumes that service-connected conditions mean a permanent earnings loss. To some degree, this philosophy encourages veterans to see themselves as incapacitated. Claims are expanding. Almost 30 percent of post-9/11 veterans receive service-connected disability pay. By comparison, the rate after World War II was 11 percent; after Vietnam, 16 percent; and after the first Persian Gulf War, 21 percent. This is partly because service members are surviving once-deadly injuries. Yet the most common conditions for which recent veterans receive disability ratings include tinnitus (ringing in the ears), lower-back strain, limited knee flexion, and scars. The system notably encourages active-duty service members to file disability claims before their discharge, even though they are still deemed fit for active duty. Strikingly, there is no finality to a claim. A veteran can, at any time, re-open a claim to seek a higher disability rating (and increase in cash payments). Because the process is open-ended, some claims are made by Vietnam-era veterans for conditions of advancing age, such as arthritis, sleep apnea, or type 2 diabetes, that would likely occur anyway. A veteran can also file a claim for a mental disorder, such as depression or alcoholism, if a service-connected medical condition, such as chronic back pain or PTSD, is the cause. Another glaring flaw in VA disability practice is that assessments of how severely a veteran is disabled can be made too early, before he or she has even received treatment. The good news is that many conditions that once spelled lifelong debilitation are amenable to new rehabilitative technologies. In most cases, PTSD is highly treatable when addressed early and when patients’ familial and employment needs are included in the therapeutic circle. Virtually all Americans agree that the government should provide a safety net for veterans incapacitated acutely by service-related injuries, whether mental or physical. Yet awarding compensation contingent upon having a diagnosed mental or medical condition often creates a perverse incentive to stay out of the workforce. This is pernicious because work is perhaps the best therapy of all. It gives sense of purpose, while providing daily structure and opportunity for socializing. The longer the period of unemployment, the more one’s confidence erodes and skills atrophy. Ultimately, the VA disability system is too committed to compensating veterans based on initial diagnoses, regardless of whether those injuries actually impair occupational or social functioning. The remedy is for the VA to offer treatment and rehabilitation for military-related injuries — and then reduce barriers to full participation in society. Those too fragile for employment while in intensive therapy, which for some could last up to a year, could receive some temporary financial support. Call it a “recovery benefit” — generous enough to meet needs, but temporary. As a last resort, a veteran who has been through high-quality rehab but still cannot work would be eligible for disability status. Benefits would be based on functional incapacity and reviewed every three to five years. Ideally, the VA could abandon the concept of service-connected disabilities altogether. All veterans, under such a scheme, would be granted Medicare or Tricare, the military’s health coverage system, as a lifetime benefit for having served their country. Thus, veterans with long-term disabilities would have all their medical care paid for if they couldn’t work after rehab services. The VA could focus its resources and attention on a smaller population of veterans with the most serious and incapacitating injuries. Those not fully able to participate in a competitive workplace would have the option of joining compensated work therapy programs. These already exist within the VA and explicitly stress the value of work and community. In its disability system, as in its health system, the VA needs to recognize how its philosophy and its program design combine in ways that fail to give our veterans the best. Most veterans, like most people, want to work. The system should focus on what they can do, not on what they can’t. Sally Satel, a psychiatrist, is a resident scholar at the American Enterprise Institute. Michael H. McLendon is a former deputy assistant secretary for policy at the Department of Veterans Affairs.